I love riding my motorcycle. I also enjoy camping. Combining the two only seems natural. After a day of twisty roads and campground tenting, however, the stink of what’s “natural” might become a little too known. Fortunately, we have solutions at the ready. Laughing as I type this, I remember taking a two-week sport touring trip with friend and fellow author Travis Burleson. It was the first of two instances where I failed to prove myself a valid camper by his standards. I’ll admit my experience with the outdoors requires mental conjuring and in both cases, my heart was set on having certain base-level “luxuries”. One such luxury (among many) was nearby running water and on-site shower stalls. I’m pretty certain he immediately affiliated me with the Yogi Bear Jellystone Park crowd but I digress. The fact is that when two people agree to camp, it’s best they agree on the specifics as well (and yes, I’m an experienced minimalist camper who grew up doing so on regular occasion). I doubt you need reminding that space is limited when traveling by motorcycle. Considering the many van-sized contraptions out there, I should consider altering this article’s headline to read “portable showers that are portably ported for portability”. I’ve done the work here, though and greatly reduced the results to compliment our [space saving but fully functional] mindset. The first is known for it’s quality and brand reliability. 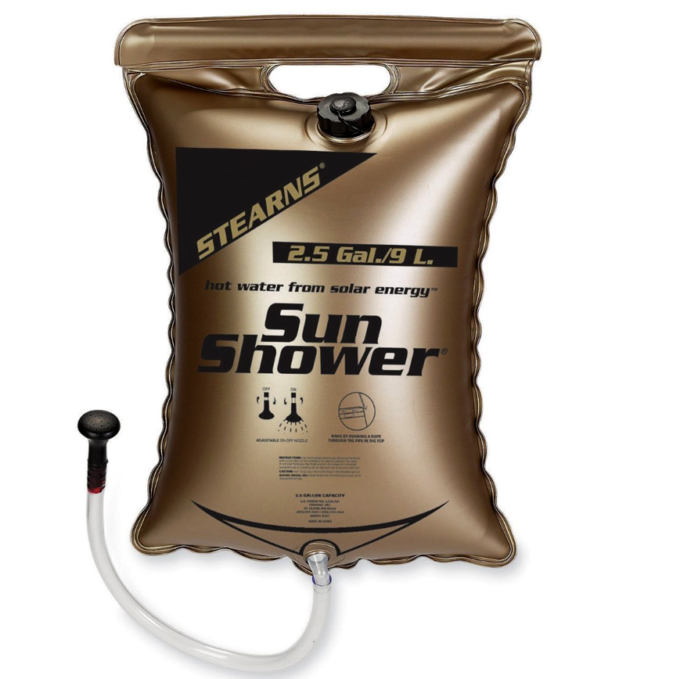 The Stearns Sun Shower, offered by Coleman, is a durable and long lasting water bag made with double-welded seams, reinforced piping and an ABS shower head. This easy-stow concept hangs conveniently for gravity-fed water pressure. Riding twisty roads all day before campground tenting, the stink of what's natural can make itself known. For that, we look to portable shower solutions. Available in 2.5, 4 and 5 gallon sizes, it’s actually best to purchase multiples of it’s smallest version. Less mass means faster heating. Remember, we’re talking solar here and this model can heat water to temperatures that are almost too hot. Other incarnations exist in typical camping outlets. 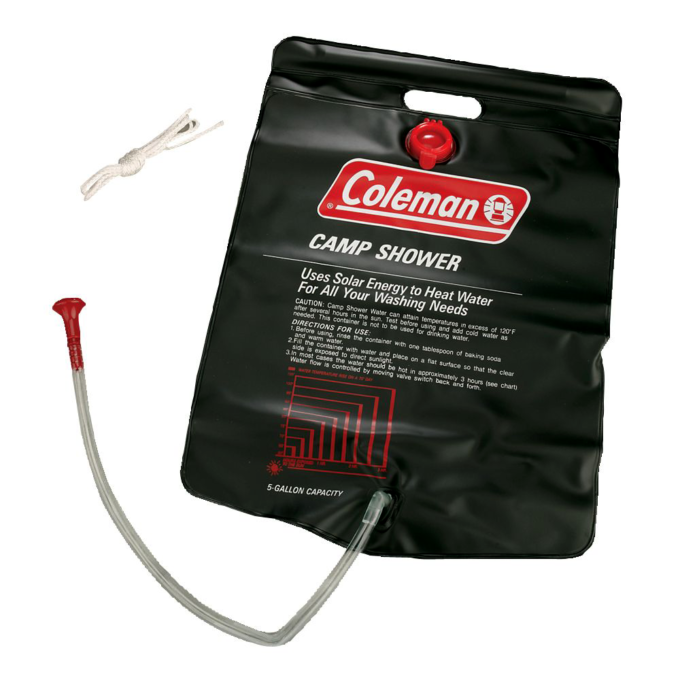 At 5 gallons, Coleman’s 18″x18″ brand-native contender is also collapsable, boasting a strong handle (rope included), inline on/off valve at the shower head and 21″ hose. There’s some concern over the water insert being pop-on/off (instead of threaded) but user reviews suggest that’s never posed a problem. Again, this is a popular format for motorcycle camping thanks to the foldable, fabric-like behavior of these camp showers. 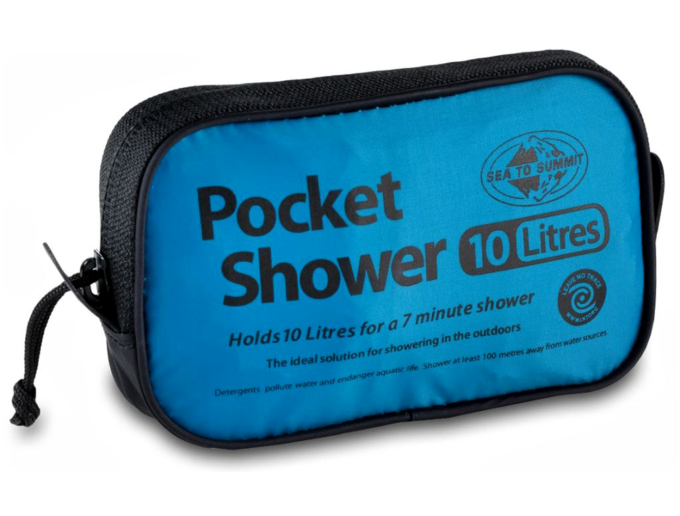 My personal favorite is the Sea to Summit Pocket Shower as it’s both durable and folds easily into it’s own minuscule carrying case. If space is your biggest concern, these eliminate the problem and perform well to boot. I might make a Gold Wing joke here but in reality, some riders actually do end up having more free space than they initially expected. Should you fit this demographic, kudos. You might benefit from Nemo’s top-shelf Helio LX Pressure Shower. The Helio LX portable shower is roughly 8.5″x5.5″ while packed. What that larger footprint includes is impressive, though. We’ve liked their products in the past, so it’s no surprise that this camp shower caught our attention in a big(ger) way. Expanding to 17″x5.5″ while in use, it holds up to 5 gallons of water. Once filled, a foot pump brings it to maximum pressure using a one-way valve that eliminates any possibility of over-inflation. Thanks to this feature, there’s no need to hang the bag and with a 7′ hose, you can either hang the shower head or rinse off by hand. If we direct our attention opposite what we began searching for, namely a way to contain and distribute water, there is another way to go. 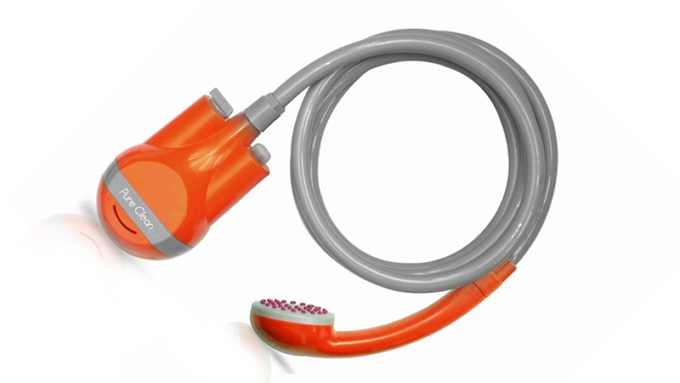 The Pure Clean portable shower is a hand-held portable shower head with an attached USB-rechargeable pump. With it’s 6′ hose, you only need to find a localized water source to drop it’s base into before cleaning up. By the way, the above video comes from the ShowerFlint project. Depending on when you’re reading this, we invite you to help in whatever way you can. Find out more here. 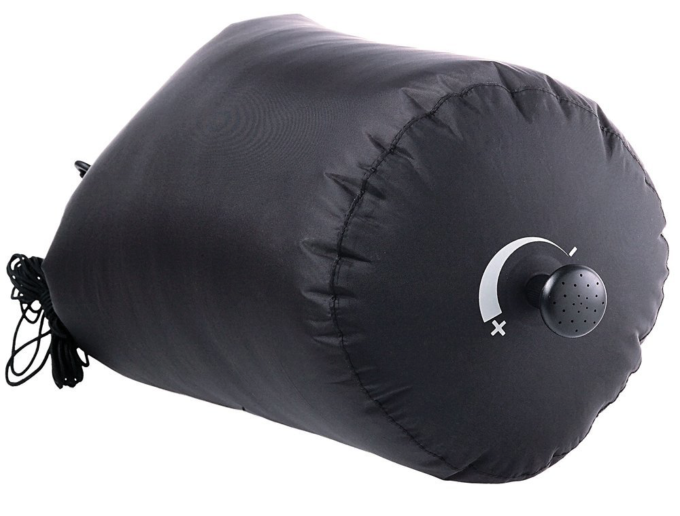 If your main concerns are storage related, any of the collapsible shower bags (solar or otherwise) above are a solid purchase. Should you have luggage to spare, Nemo’s got the “elegant survivalist” covered. Albeit obscure, maybe a rechargeable camp shower head resolves the matter. How Do You Address Shower Needs When Motorcycle Camping? There are a lot of great shower/hygiene products on the market. Which ones have you tried? What do you like each and why? Your input is invited. Post an article! Entering your article is an easy ride ... just type! Your submission will appear on a web page exactly as you enter it here. Three hundred words (or more) is optimal. People "scan" web pages, so include your best thoughts in your first paragraph. Don't forget to mention your website, if you have one. Do you have an image to add? Great! Click the button, find it on your computer and select it. Please tick the checkbox to acknowledge that you agree with our submission guidelines.